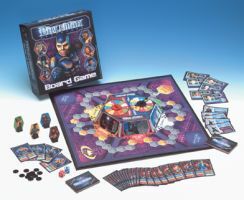 The BibleMan Board Game offers two challenging and rewarding games in a single box! One version of the game is for children ages 3-6, and the other is for ages 7 and up. However, both versions allow simultaneous play and focus on the same goal. Players start by choosing a hero card then attempt to be the first to rescue six children that were tricked by God’s enemies.